We are in it! Just had a fab day at the Heritage Coast Centre with 3 lovely guests, Jo (Editor) and Jenny (photographer) from Countryfile Magazine and Mel who writes for Bristol based magazine ‘The Spark’ The course was our Willow Weaving Taster Course where participants had a chance to make something from each of our courses. We started the day with brightly coloured willow hoops using gorgeous fresh gold, green and black willow. The we made some pretty hearts before starting work on a simple mini frame basket. Lunch cooked by Cooking Camper was delicious, Squash, sage and thyme soup with bread straight from the oven and bean and potato salad, yum. 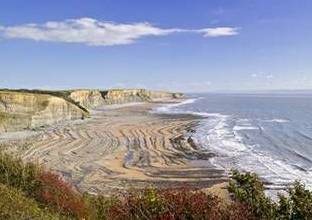 We then took a walk up to through the gardens of Dunraven Castle to look at the stunning scenery and cliffs at Temple Bay. 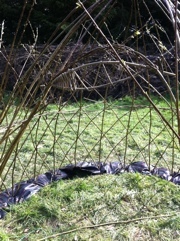 The sun shone, fleeces came off and we worked to construct a twisted gothic arch at the bottom of the steps in the gardens. 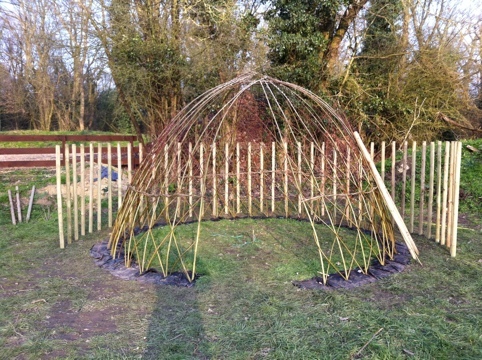 We used a mixture of purple, silvery gray and gold willow to create a simple but stunning structure which will hopefully grow well in the shelter of the walled garden. Thanks everyone for making the day such fun – the April issue will be on the shelves shortly, don’t miss your copy and hope to see you again soon! Day flew by, lots of excitable children. 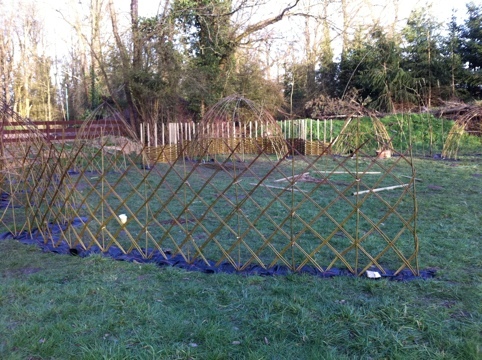 Started the fedge, final bit of living willow. 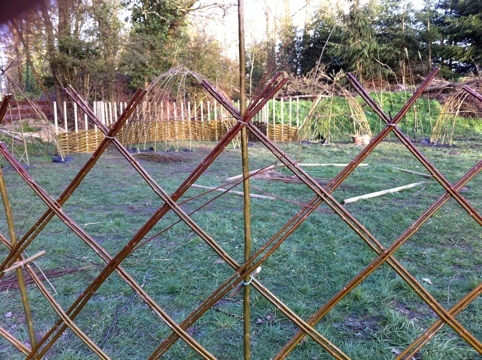 We decided to weave two lovely Flanders red rods at a time for the diagonal pattern which will match up with the large hut at the back. 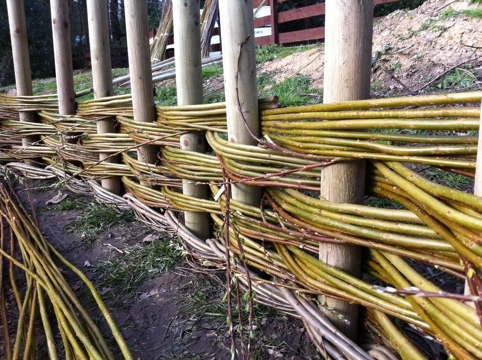 Still a bit to go on the woven panel at the back but with the children’s help it seemed to grow quite quickly. Lots more imaginative games and playing in the willow huts we now have a shopping centre to go along with the doctor’s surgery. Log man turned up with the tinniest logs ever for the log circle so we sent him packing. 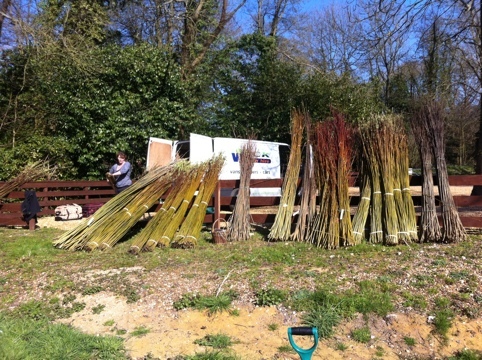 Sun still shining, loads more weaving, can’t stop the birds from singing, anyone know how to shut up a cockerel? 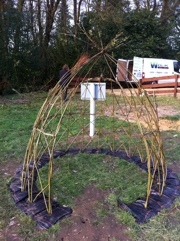 Willow village coming on splendidly, had first group of children play in it which was wonderful to see. We now have a fishmongers, a doctor, a church, the White House, a baker, just to name a few of the new residences of the willow village. Started the woven fence at the back of the extra large dome, really exciting, uprights in for the wood stores so well on track. Italian restaurant tonight as a treat, what with Dave’s breakfasts, waitrose picnics and cafe cakes going to have to do Rosemary Connelly extreme dieting for a month! 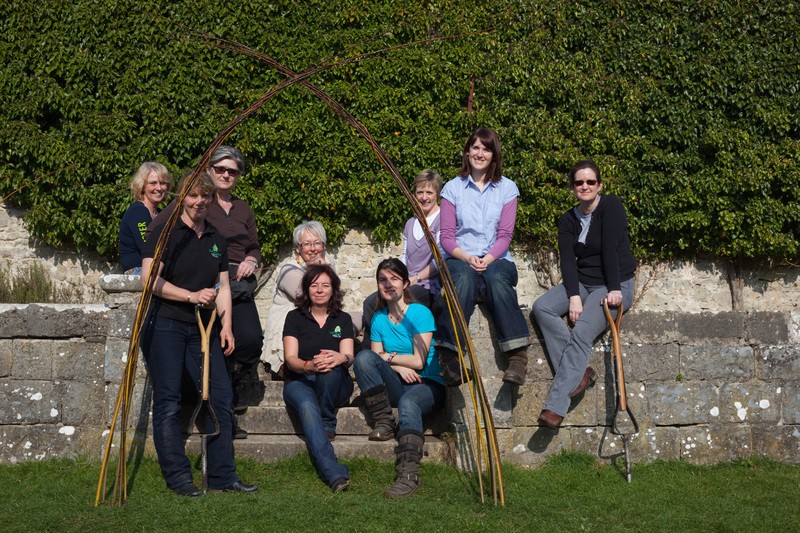 Glorious day again, birds singing, sun shining and lots of willow weaving. Started with a very hearty breakfast cooked by Dave, our friendly owner of the very comfortable 15th century hunting lodge we’re staying in. We opted for the full English and not the yoghurt and fruit obviously, slightly regretted it later getting stuck into the derby dibbing. 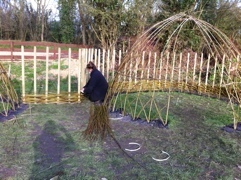 Clare worked like a demon sledging the wooden stakes in for the woven surround of the large hut, I had the very strenuous job of holding them level, it’s going to look fab though, can’t wait to start the weaving. 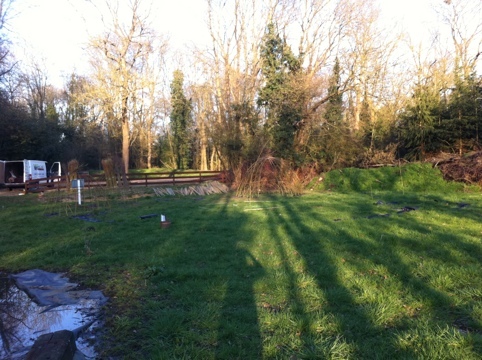 Children worked very hard planting the smaller domes, had all of them on the derby dibber, puffing away and they’re already getting precious about their very own domes, “I want to live here,” one of them cried. 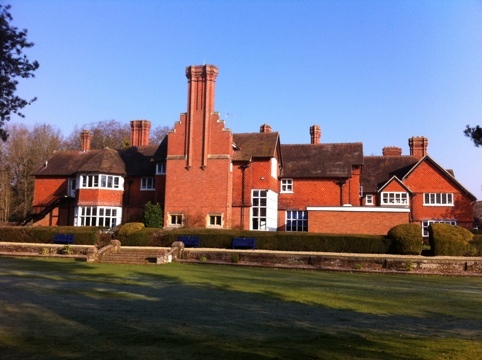 Looking forward to next couple of days, fingers crossed weather will hold.